To keep operators performing at their best, it’s important to provide a comfortable work environment. Hyster® warehouse trucks are designed to support demanding food and drink warehouse applications, with solutions to help keep drivers happy, and productive. 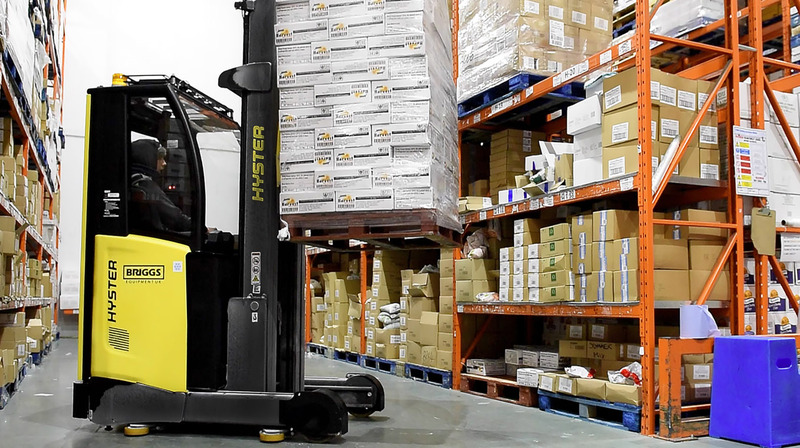 In the many sub-zero warehouses found in the food supply chain, Hyster® Reach Trucks can make the extreme environment more comfortable for the operator. With the option of a fully insulated cold store cab, drivers can be completely enclosed so that even in temperatures of -30 degrees C, their environment maintains a comfortable temperature of 15 degrees C.
Even in bulky protective clothing, the door is easy for drivers to open and close and mounting the truck via a low step is simple. Once in the spacious cab, there is a full suspension seat, adjustable steering column and intuitive mini-levers and joystick controls. An intercom also enables communication without the need to open the door, keeping the operator warm inside. The extensive range of Hyster® Pallet Trucks and Hyster® Pallet Stackers allows food and beverage applications to choose the right truck for their operation, as well as for the optimal comfort of their operators. 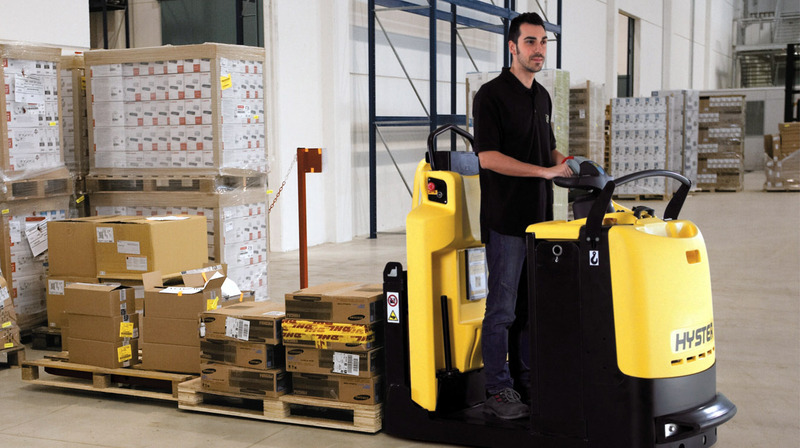 For instance, the Hyster® Pedestrian Powered Pallet Truck series includes features to help operators easily control the movement of the truck, and maintain a better body position. Intelligent Lift™ enables pallets to be transported and lifted in one seamless movement without having to hold down the button, while Intelligent Slow Down™ assists operators further by reducing the speed on cornering for more confident manoeuvring. The P1.6-1.8 models also have a Low Noise option to help improve the working environment for the operator, and others in the warehouse. 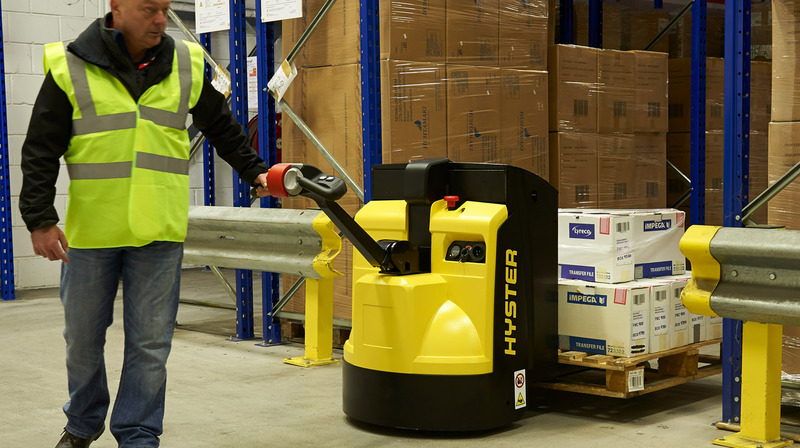 In some food and drink warehouses, the Hyster® Rider Pallet Truck or Hyster® Rider Stacker can be ideal. Both feature an innovative ‘3 in 1’ design that allows the operator to sit, stand, or lean whilst driving – whichever is most comfortable. The patented seat design, with swinging seat cushion and fixed back rest, means that the operator can switch position throughout the shift at the touch of a button. For added comfort when getting on and off, the truck also includes a low, wide step, and a suspended floor plate and cushioned floor mat help reduce the vibrations felt by the driver, improving their operating environment. 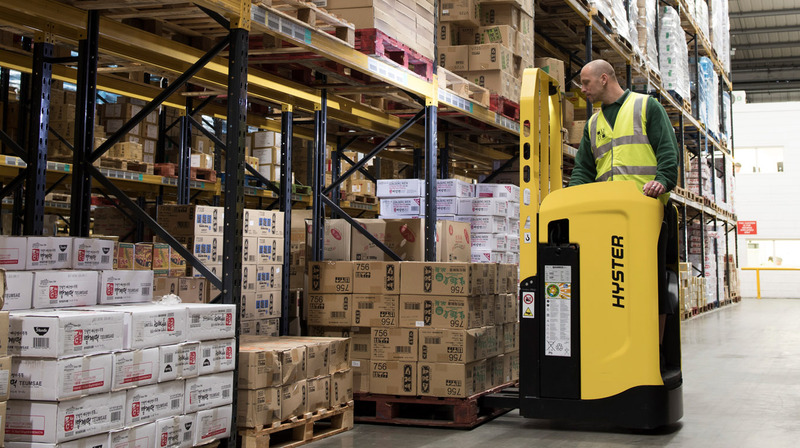 Where food and drink operations are time sensitive, the Hyster® Low Level Order Picker offers comfort for the operator alongside reliability. For example, with the optional coasting function on the Hyster® LO2.0-2.5 models, drivers do not need to mount and dismount so frequently as at the push of a button, the truck can move to the next pick location. However, when the operator is on board, a high, soft-touch back rest offers a comfortable driving position. Plus, with scooter control and electric steering, the arm movements required to change direction are reduced, lessening operator fatigue and increasing productivity. A foot controlled lifting platform option also reduces reaching from rack to pallet by enabling up to second level picking, while on LO1.0F and LO2.0S optional fork controls can help the operator maintain the pallet at a constant, comfortable working height. To find out more about how the Hyster® warehouse range can support your food or beverage logistics operation and enhance driver comfort, contact your local Hyster® dealership or visit www.hyster.eu. This entry was posted in Batteries, Counter Balance, Cross-Docking, Electrics, Food Sector, Hand Pallet Trucks, Intensive Applications, LI-Ion, Lithium-ion, ReachTruck, Solution, Warehousing and tagged Ergonomic order picking, Hyster, Intelligent Lift, Pallet Stacker, Pedestrian Powered Pallet Truck, ReachTruck, Warehouse. Bookmark the permalink.